Risers provide clearance for the storage drawer units. 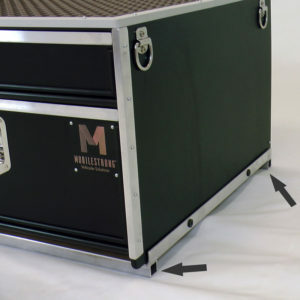 A standard Composite Storage Drawer unit incorporates a set of 1” tubular metal foot bars. Some situations require extra clearance to operate the drawers without obstruction. The solution is a set of 2” risers. A set equals 3 metal foot bars, each running the width of the unit (front, center, and rear). The foot bars are a tubular, square, or rectangular painted aluminum construction. Risers are pre-installed at the factory.